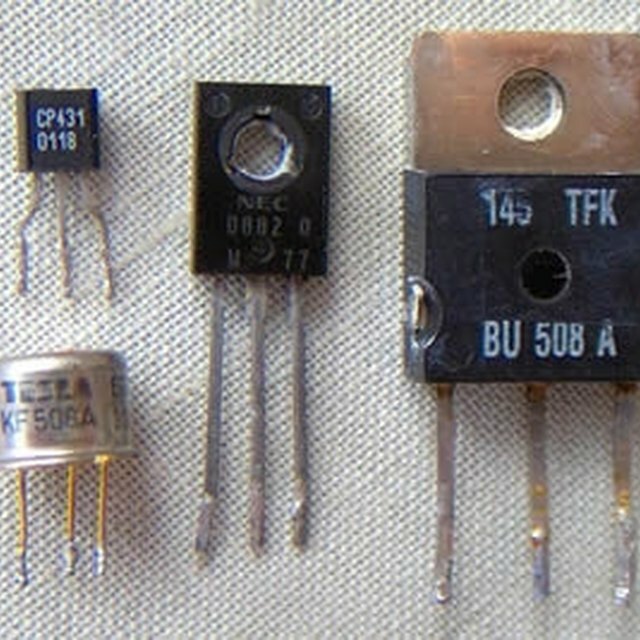 Transistors are the building blocks of the modern electronic era. They function as small amplifiers that amplify electrical signals as necessary to facilitate circuit functions. Transistors have three basic parts: the base, collector and emitter. The transistor parameter "Vce" signifies the voltage measured between the collector and emitter, which is extremely important because the voltage between the collector and the emitter is the output of the transistor. Moreover, the primary function of the transistor is to amplify electrical signals, and Vce represents the results of this amplification. For this reason, Vce is the most important parameter in transistor circuit design. Find the value of the collector voltage (Vcc), biasing resistors (R1 and R2), the collector resistor (Rc) and the emitter resistor (Re). Use the transistor circuit drawing on the Learning About Electronics webpage (see Resources for link) as a model of how these circuit parameters connect to the transistor. Refer to the electrical schematic of your transistor circuit to find the parameter values. For illustrative purposes, assume your Vcc is 12 volts, R1 is 25 kilohms, R2 is 15 kilohms, Rc is 3 kilohms and Re is 7 kilohms. Find the value of beta for your transistor. Beta is the current gain factor, or the transistor amplification factor. It shows how much the transistor amplifies the base current, which is the current that appears at the base of the transistor. Beta is a constant that falls in the 50 to 200 range for most transistors. Refer to the transistor data sheet provided by the manufacturer. Look for the phrase current gain, current transfer ratio or the variable "hfe" on the data sheet. If necessary, contact the transistor manufacturer for this value. For illustrative purposes, assume beta is 100. Rb = [(25)(15)]/[(25 + 15)] = 375/40 = 9.375 kilohms. Vbb = 12 * [15/(25 + 15)] = 12 * (15/40) = 12 * 0.375 = 4.5 volts. Ie = (4.5 - 0.7)/[9,375/(100 + 1) + 7000] = 3.8/[92.82 + 7000] = 3.8/7,092 = 0.00053 amps = 0.53 milliamps. Note: 9.375 kilohms is 9,375 ohms and 7 kilohms is 7,000 ohms, which are reflected in the equation. Vce = 12 - 0.00053 (3000 + 7000) = 12 - 5.3 = 6.7 volts. Chestnut, Dwight. "How to Calculate the Value for the Vce in a Transistor." Sciencing, https://sciencing.com/how-10073558-calculate-value-vce-transistor.html. 07 August 2017.